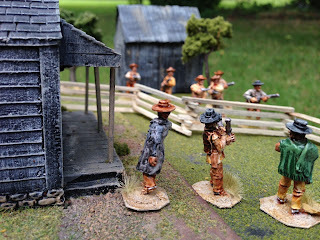 I'm working on a 28mm Old West skirmish game with my friend Chris. He's currently assembling 4Ground buildings and I'm painting figures. 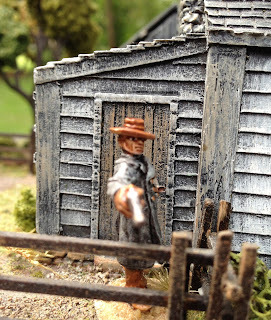 We are likely going to use "Dead Man's Hand", "Desperado", the old TSR game "Boot Hill",.... or write our own rules! Any suggestions? Anyway, here are a few shots of what I'm working on. 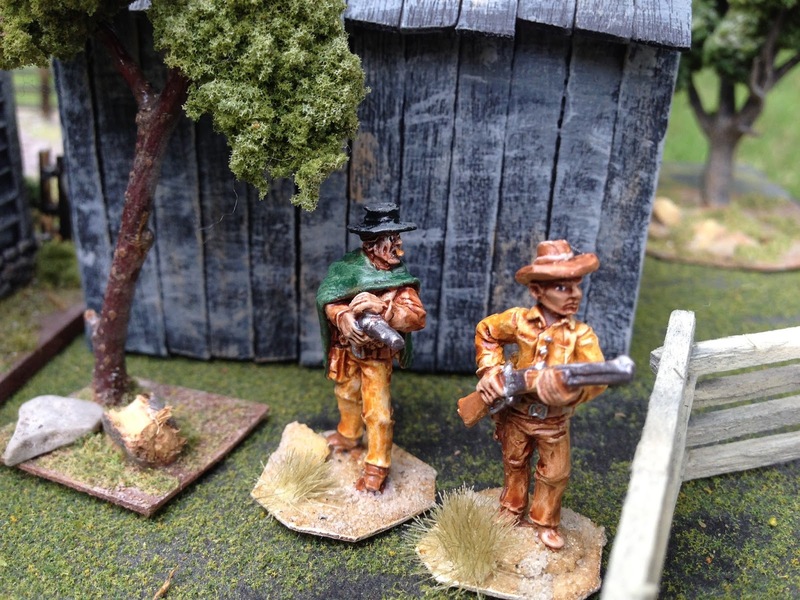 These are wonderful 28mm figures from Knuckleduster, which I highly recommend! The Franklin Brothers are looking for trouble! "Old John" Selman and Zip Wyatt are some of the fastest guns that ever lived! Sgt. 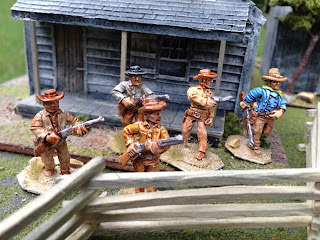 Williamson - US Cavalry - bringing some law and order to town! Things are about to get ugly in "Promise City"
Awesome - love them. Knuckleduster are some of my favourite miniatures. 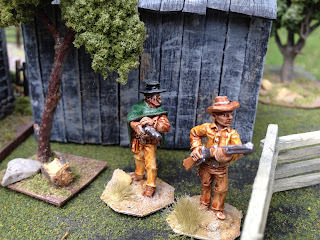 Do you have the Mexican bandidos? They are nicely done Cory! (New follower.) Those look great! I picked up a few Knuckleduster minis a while back and hope they look as good. 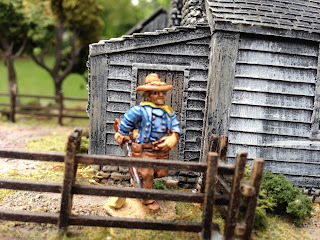 Nice looking buildings and figures! Love the weathering on the terrain and the figures are superb. 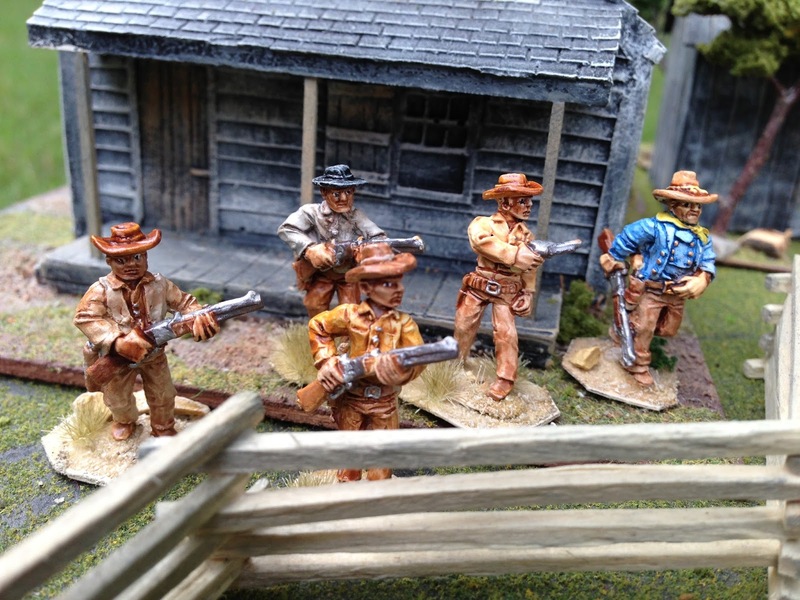 I can suggest A&* Showdoen, the cutdown skirmish rules for teh Aces and Eights RPG. 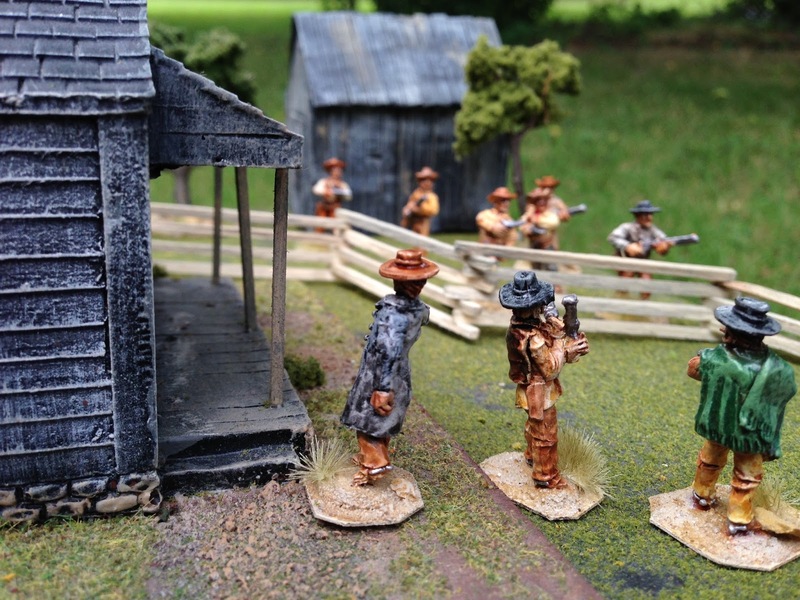 A bit more fiddly than real skirmish rules with the "shot clock." Also, Gutshot is a true skirmish game that is also fun to play. Aces and Eights good set of rules. AWI Jager & Highlander Greens Have Arrived! New project - Painting a large figure! 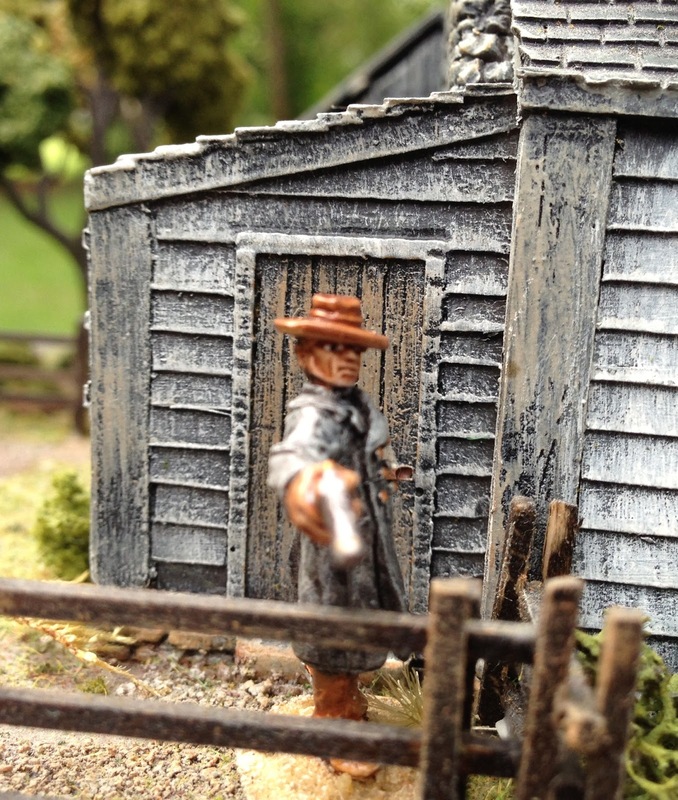 New ACW Rules from John Hill? What's new on the painting table? Welcome to Cigar Box Heroes! 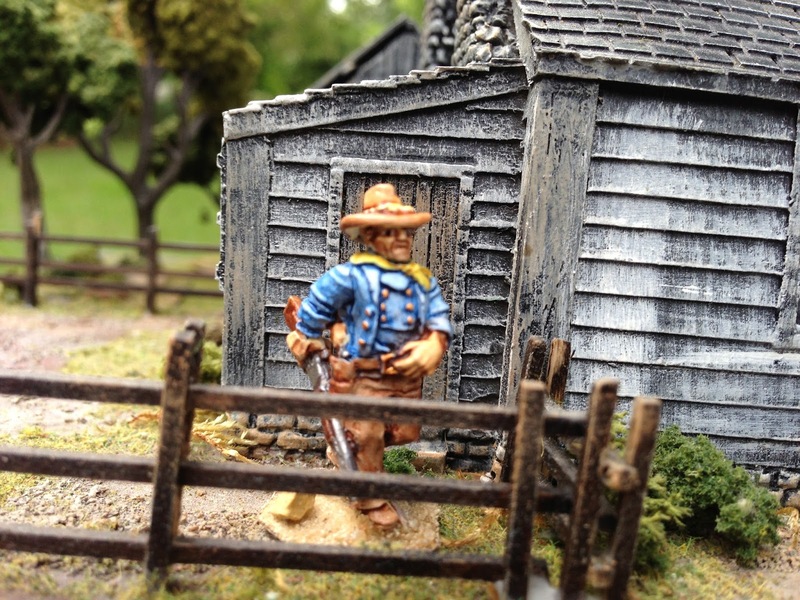 This is a blog about my hobby of miniature wargaming. I particularly enjoy the the AWI, SYW, Nap and ACW periods. Take a look around the blog,and please feel free to leave comments!